Sg Truth: Will PAP be the Major Casualty? 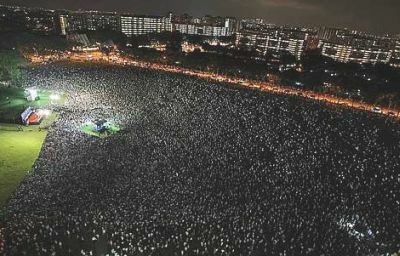 Huge gathering: A massive crowd turning up for a Workers’ Party rally in Hougang on Thursday night. —The Straits Times / Asia News NetworkFrom: "truth"
cheating ways, they may continue to dominate parliament but there will be blood on the streets of Singapore. Gen Y is brave. Gen Y is restless. Gen Y wants fairness. Gen Y wants accountability. Gen Y wants a better life for all. is real and helps to maintain the pap in power for so long. 5. The social networks like FB are major tools for change and revolution. Its' impact on GE2011 will be huge. extent of the damage to the pap this evening towards the close of polling. THE themes of this general election began emerging on Day 1 of the campaign, as the first rally speeches rang out in five housing estates across the island. Thousands turned up on Thursday night to listen to what the contending parties had to offer. The first rallies by the Workers' Party (WP) and the People's Action Party (PAP) took place just 1.5km apart, at fields in Hougang SMC and Pasir Ris-Punggol GRC, respectively. Their messages, however, could not have been further apart. The ruling party sought to focus voters' attention on the tangible and the immediate namely, the concrete improvements that its government and its candidates have made to people's daily lives, at both the national and local levels. On the cost of living, which has emerged as a top concern among voters, the PAP's key message is that its “Grow and Share” package of rebates, growth dividends and top-ups, paid out directly to individual Singaporeans, is the best way to help all groups, especially the poor and the elderly. Deputy Prime Minister Teo Chee Hean made the point in his rally speech in Pasir Ris-Punggol GRC, and Prime Minister Lee Hsien Loong did so in his party political broadcast. Most lower-income families have each received between S$3,000 (RM7,200) and S$4,000 (RM9,600) this year to help them cope with cost of living increases, both PAP leaders said. The candidates of Pasir Ris-Punggol GRC highlighted local improvements in the wards they represent parks, playgrounds, childcare centres, senior citizens' corners, transport links and covered walkways. That has also been the message of other PAP GRC teams in their GRC manifestos, and during their walkabouts and press conferences. In their rally speeches, PAP candidates Michael Palmer, Zainal Sapari and Gan Thiam Poh also attacked their opposition challengers for their lack of plans to improve voters' lives. Just down the road, the speeches at the WP rally, at a field next to Hougang MRT station, sought to shift the focus of this election to a far less tangible ideal the First-World Parliament that the party has made its election slogan. Its leaders exhorted Singaporeans to vote more opposition members into Parliament, especially “more hammers”, the party's symbol.